View our menu items that are available for all river tubing, rafting, canoeing and kayaking river country adventurers! You can enjoy freshly-cooked, mouth-watering, island BBQ, which is now more than just hot dogs! Quench your thirst with an ice-cold beverage and a frozen candy bar or bag of potato chips! Refuel, re-energize and get the energy you need for your river adventure on the Delaware River! 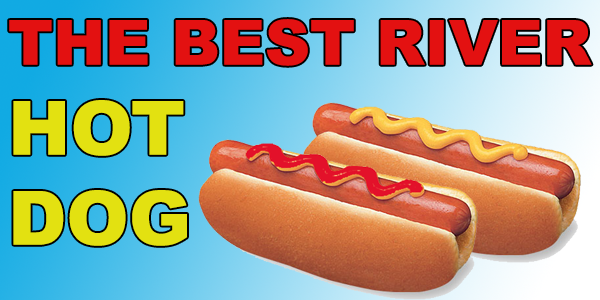 THE FAMOUS RIVER DOG: The original famous river dog has been available since 1987! The hot dog is all-beef and served on a fresh and fluffy roll. Kayakers, rafters, canoers and tubers can't say they've "Done the Delaware" without stopping for one of these bad boys. JUICY ISLAND BURGER: You will surely smell the inviting scent of our juicy island burgers way before you see Adventure Island on your tube, raft, canoe, or kayak adventure. Our all-beef burgers are freshly cooked on our island grill and can be served with or without cheese. The sizzling and juicy island burger is then served on a fresh and fluffy bun. SIZZLING CHICKEN SANDWICH: Our mesquite sizzling chicken breast sandwiches are filled with deliciousness that will make you want to come back for more! Cooked fresh on our island grill and served on a fresh and fluffy bun. We can serve your chicken sandwich with or without cheese. SUPER VEGGIE BURGER: If you don't like our meat options, or have special dietary requirements, we now offer delicious super veggie burgers! Our soy veggie burgers are cooked fresh on our island grill and can be served with or without cheese. We then serve this delicious vegan alternative on a fresh and fluffy bun. We promise you'll love this, even if you're a "meat-eater" only. CRUNCHY NACHOS & CHEESE: If you don't like our meat options, or have special dietary requirements, we now offer delicious nachos and cheese. Our crunchy nacho chips are served with hot nacho cheese to give you the kick you need on your river tubing, rafting, canoeing, or kayaking trip! PEPSI: Pepsi is served ice-cold in a 12oz cup. DIET PEPSI: Diet Pepsi is served ice-cold in a 12oz cup. FRESH LEMONADE: Our Country Time Lemonade is served ice-cold in a 12oz cup. COLD BOTTLED WATER: We also offer ice-cold bottled water if you prefer not to drink soda or lemonade. SNICKERS: Don't be "hangry" and stuck on the river! Eat a cold snickers! MILKY WAY: If peanuts aren't your thing, try a delicious cold Milky Way! TWIX: If one candy bar isn't enough, Twix will have you covered with left & right Twix. POTATO CHIPS: Regular, BBQ & Assorted Flavors if chocolate isn't your thing. Tubing, rafting, canoeing and kayaking down the river is supposed to be fun and lugging coolers around in water is no fun so let us take care of the food. Nothing beats a hot meal and an ice-cold beverage on a hot summer day while enjoying the river. Don't ruin the day by having sandwiches get soggy! Visit us and enjoy food without littering or worrying about trash. Experience the river tube, raft, canoe or kayak ride the way it was meant to be. Regardless of whether you stop, please help us keep the river clean and recycle any waste. We want to help preserve the delicate ecosystem and wildlife. Did you know that you get a FREE BBQ MEAL with Delaware River Tubing? River kayakers, canoers, rafters, tubers, boaters, and fishermen are all welcome to stop and visit us while enjoying a fun day on the river. 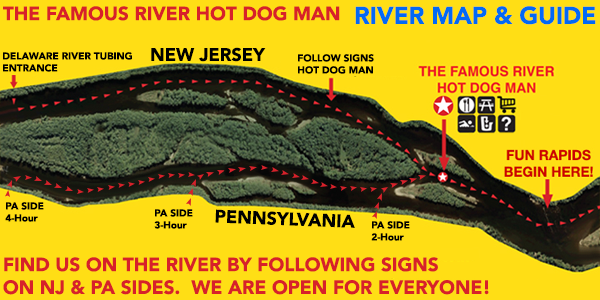 If you choose to use Delaware River Tubing in Milford, NJ, you get a FREE BBQ MEAL with us at the Famous River Hot Dog Man! No kayak, raft, tube, or canoe trip is complete without stopping at the Hot Dog Man on the Delaware River! Browse our menu, which doesn't include just hot dogs anymore! Delicious chicken, nachos and cheese, vegan and kosher options available!